Due to an exceptionally strong third quarter in which 928,800 sq ft of space was taken between the core Scottish office markets (wider Aberdeen, Edinburgh city centre, Glasgow city centre). Over 1.9 million sq ft of office space has been taken so far this year. Because of this, take-up has already exceeded the five-year annual average of 1.8 million sq ft by 6%. After an extremely strong second and third quarter, Glasgow has accounted for 62% of total take-up achieved within the core Scottish markets so far this year. 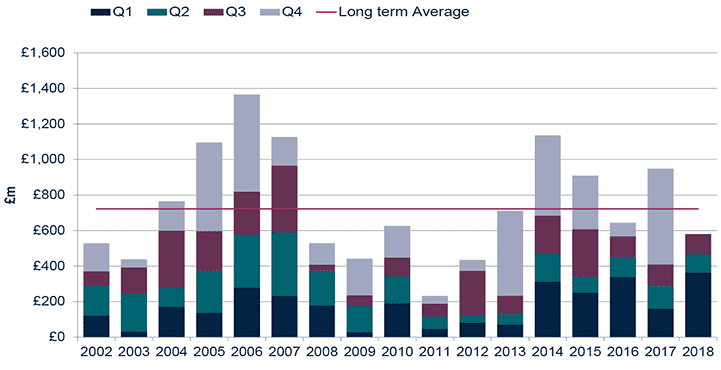 Glasgow’s strong take-up levels have been driven by two large banking deals during Q2 and Q3. During Q2, Clydesdale Bank signed for 110,955 sq ft at 117 Bothswell Street, which is currently under construction and due to complete in late 2020. During Q3, Barclays signed a 470,000 sq ft pre-commitment deal at Buchanan Wharf. The city centre development will house the banks technology, functions and operations teams and bring up to 2,500 new jobs into the city. Due to this large deal Glasgow’s Q3 city centre take-up totalled 611,849 sq ft, almost ten times larger than Q3 2017. After a strong first half total take-up currently stands at 1.2 million sq ft, already more than double the 10-year annual average and over three times larger than 2017 Q1–Q3. Banking was the most active business sector within the core Scottish markets, accounting for 38% of Q1-Q3 take-up, with most of this coming from three Glasgow deals. Public Services, Education and Health have also been particularly active so far this year, accounting for 20% of total take-up, with 92% of that coming from Glasgow. Key deals during Q3 included HMRC signing for 60,556 sq ft of city centre office space at 123 St Vincent Street and Glasgow School of Art taking 10,958 sq ft space at Breckenridge House. Availability in Glasgow currently stands at 1.4m sq ft of which 280,000 sq ft is Grade A. Glasgow city centre supply has been decreasing since 2014. Since 2017 total supply has fallen by 16% and Grade A by 34%. 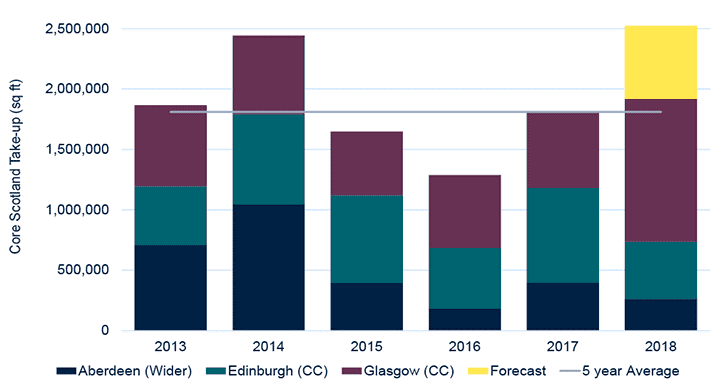 As Glasgow’s popularity among occupiers shows no signs of slowing, we expect Glasgow's supply schedule will continue to diminish during 2019. Rents in Glasgow remain strong, top rent achieved during 2018 stands at £32.50, which was achieved at 177 Bothwell Street during Q2. It is anticipated that the next development cycle will achieve greater headline rents, although we expect rents to remain at this level until the end of 2018. Aberdeen’s wider market take-up reached 93,127 sq ft during Q3, bringing take-up for the year-to-date to 264,844 sq ft. Take-up levels are currently in line with 2017 figures, although space has been taken across a larger number of smaller deals. From 2017 Q1-Q3 there has been a 37% increase in the number of deals, demonstrating strengthening levels of stability in Aberdeen’s office market. A greater number of smaller deals indicates a market which is less susceptible to fluctuation from large individual deals. Typically, Aberdeen’s take-up has been dominated by the Oil and Gas industries with the Engineering, Extraction and Utilities sectors taking a majority of space. While Aberdeen’s take-up is still very much dominated by these industries, so far this year we have seen a wider variety business sectors taking space in Aberdeen. During Q3, the Insurance, Financial Services and Public Services accounted for over a quarter of take-up. This is in contrast to the five-year average in which these sectors have accounted for less than 10%. Oil prices have been rapidly increasing throughout 2018 starting the year at $66 per barrel and peaking at $86 per barrel (3rd Oct). Whilst the oil price has now fallen back to $60 per barrel it is widely expected to rally again toward the end of the year. Aberdeen’s economic reliance on the Gas and Oil industries normally insures that when oil prices increase take-up and investment volumes increase. We therefore expect Aberdeen to see significantly higher levels of office take-up during 2019. During Q3 Noble Drilling signed for 16,591 sq ft at Stratus Building in ABZ Business Park, Dyce, the largest deal in Aberdeen so far this year. 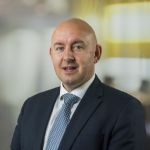 Typically drilling companies taking space is an early indication of a strengthening energy sector – suggesting the likelihood of future growth within Aberdeen’s office market. Availability in Aberdeen currently stands at 2.7m sq ft of which 940,000 sq ft is Grade A. Supply in Aberdeen has continued to increase since the 2014 oil price shock and is currently at its peak. 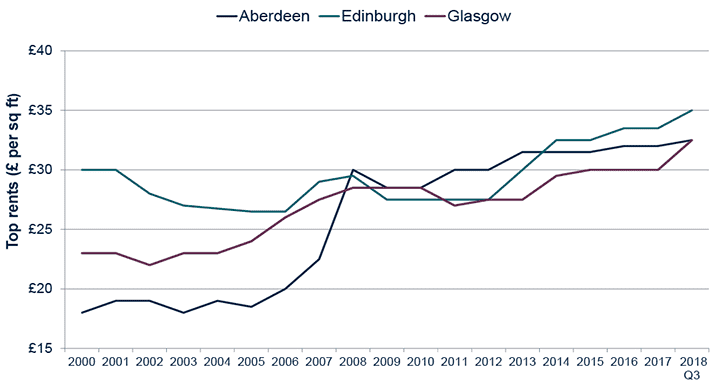 However, despite Aberdeen’s over supply Grade A rents remain strong. Top rent achieved so far this year currently stands at £32.50 which was achieved in multiple deals at The Silver Fin building. 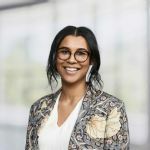 Savills expects that during 2019 Aberdeen's availability will begin to fall, enabling further rental growth in Aberdeen's office market. Edinburgh city centre office take-up reached 223,824 sq ft during the third quarter of 2018, amounting to 470,947 sq ft for the year-to-date. The insurance and financial services have been particularly active within Edinburgh accounting for 45% of Edinburgh’s total take-up – while they typically form an active part of the market this is a 54% increase on the five-year average. Key deals in Q3 include Royal London taking 47,912 sq ft of Grade A space at 22 Haymarket Yards and Artemis taking 13,710 sq ft of space at exchange plaza. Edinburgh also saw a number of deals less than 5,000 sq ft. 81% of the number of deals to this sector were less than 5,000 sq ft, totalling at 25,516 sq ft.
Edinburgh’s city centre supply has been rapidly falling since 2012 and currently stands at 400,000 sq ft, 50% of which is Grade A. With a majority of new developments being pre-let or let pre-completion Edinburgh’s development pipeline continues to diminish. This demonstrates the level of demand in Edinburgh’s office market which ensures new developments move quickly from the supply schedule. We predict that by the end of the year there will be a net deficit of Grade A office supply within Edinburgh’s city centre. Top rent in Edinburgh currently stands at £35 per sq ft which was achieved in a pre-let deal at The Mint Building, 20 West Register Street to Ballie Gifford – a new development which is currently under construction and due to complete in the first quarter of 2019. Edinburgh's under-supply of office stock has facilitated significant rental growth throughout 2018. We expect this trend to continue, with rents of over £35 per sq ft likely to be achieved during 2019. Key pre-lets in Edinburgh during Q3 include Brodies signing for 43,000 sq ft and Pinsent Mason taking 25,000 sq ft both at Capital Square. Savills forecasts that take-up within the core Scottish markets will exceed 2.5 million sq ft by the end of 2018. During the third quarter of 2018 office investment within the core Scottish markets reached £113 million, bringing the current year-to-date total up to £580 million, in line with the Q1-Q3 five-year average. Aberdeen and Glasgow experienced a surge in investment at the beginning of the year, which has since slowed. Overseas investors are dominating investment in Aberdeen and Edinburgh, accounting for 89% of Aberdeen’s office investment and 70% of Edinburgh’s. During quarter one Aberdeen received £171 million in office investment, of which £151 million came from overseas investors. This influx of overseas investment in Aberdeen was likely a reaction to the strengthening energy sector. £39 million of Aberdeen’s office investment came from Middle Eastern investors. Due to this Aberdeen investment volumes are currently at their highest level since the 2014 oil price shock. Glasgow saw £41 million of office investment deals completed during Q3, with a significant number of deals still under offer. Although this quarter, investment in Glasgow has been slower than usual, due to the strong investment levels in Q1, Glasgow office investment currently stand at £212 million. 51% above the long term Q1-Q3 average. There was £57 million in office investment during the third quarter of 2018 in Edinburgh, bringing the year-to-date total up to £186 million. Key deals included M&G Real Estate acquiring 40 Torphicen Street for £22.15 million reflecting a 5.97% yield and German firm KanAm purchasing 12 Blenheim Place for £17.57 million with a 5.27% yield. Prime office yields remain at 6.25% and 5% for Aberdeen and Glasgow respectively, whilst Edinburgh's prime yields have moved in a further 25 bps to 4.5% amid strong investor demand for the capital. Glasgow’s wider market take-up has been steadily increasing since 2011, but as new developments on the city centre periphery and outskirts are being developed Glasgow’s city centre boundaries are being redefined. As Glasgow’s popularity increases, supply continues to fall, forcing occupiers to look beyond Glasgow’s original city centre boundaries in order to find appropriate space. Barclays decision to develop their new headquarters at Buchanan Wharf, purchasing 470,000 sq ft at the mixed use Clydeside site, will be key in rejuvenating a previously run down part of Glasgow’s periphery - ensuring its place within Glasgow’s city centre boundaries. Buchanan Wharf, which sits on the south bank of the river Clyde, is only a 10 minute walk from Glasgow central station, has easy pedestrian access across the River Clyde, multiple bus stops and M8 motorway access that enables travel to Glasgow airport within 15 minutes. This site is set to be crucial in Glasgow’s city centre extension, as it breathes new life into a previously neglected area of the city. The Buchanan Wharf mixed use scheme will provide over a million sq ft of Grade A office space, residential accommodation, a hotel, amenities and public spaces. It is believed that such a large development in this part of Glasgow will attract further investment to the Clydeside area. There are many opportunities for development including a number of old and unused industrial units, which could be redeveloped into functional residential and commercial space. Glasgow City Councils latest Development Plan Policy and Proposal Map identifies the south bank of the Clyde as a City Centre location. This is in contrary to previous versions that have identified Glasgow city centre as ending at the north bank of the Clyde, cementing this area of as part of Glasgow’s expanding city centre.